Kangana Ranaut Reveals Priyanka Chopra Is Excited For Her Wedding With Nick Jonas! ‘Fashion’ co-star Kangana Ranaut also confirmed that her friend Priyanka Chopra is engaged to American Singer Nick Jonas! Finally, someone has shed some light on the reported engagement and upcoming wedding of Priyanka Chopra and her American beau Nick Jonas! After ‘Bharat’ director Ali Abbas Zafar’s cryptic tweet that sent us all in a tizzy, ‘Manikarnika’ actress Kangana Ranaut is the first Bollywood celebrity to have officially commented on the allegedly upcoming Priyanka Chopra and Nick Jonas’ wedding. Kangana dished out the details while attending Vouge Beauty Awards. When the ‘Manikarnika’ actress was asked to comment on Priyanka Chopra’s engagement and upcoming wedding to American singer Nick Jonas, Kangana revealed that Priyanka sounded ‘excited and very happy’ when she called to congratulated her. Kangana further added that Priyanka Chopra has not revealed the wedding date to her as of yet. 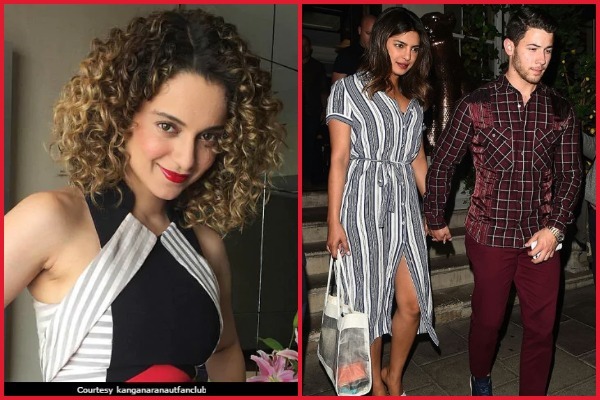 Earlier Kangana Ranaut was in news when she jokingly revealed that she is upset that her former ‘Fashion’ co-star Priyanka Chopra did not invite her to the engagement party. If reports are to be trusted, we are sure no Bollywood celebrities were present while Nick popped the question to Priyanka as the actress was in London celebrating her 36th birthday with her beau, his brother Joe Jonas and his fiancée Sophie Turner. Reportedly Nick Jonas chose to have complete privacy while he selected a ring for his Lady love. As per reports, Nick Jonas had the Tiffany & Co. flagship store in New York completely shut down while he was searching for a perfect ring for Priyanka Chopra. However, unfortunately we still do not have a picture of the beautiful engagement ring. Previous : After Break-Up With Alia Bhatt, Is Sidharth Malhotra Dating Actress Kiara Advani?